Other Information Rates are subject to change based on events and occupancy in the Las Vegas market. Are you ready to experience the luxury of a five-star Las Vegas condo hotel? If so, then relax in the MGM Signature's perfect taste of elegance that offers everything you are looking for. 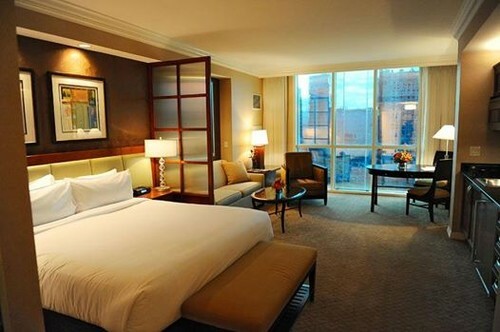 This Deluxe Suite has high-end amenities that will dazzle your senses. With a total of 550 sq feet, these suites have a kitchenette with microwave, two-burner stovetop and miniature refrigerator, spacious marble whirlpool spa tub with separate glass enclosed shower, a king size bed featuring luxurious linens, and queen sized sleeper sofa for additional guests. Flat screen TV's, comfortable sitting area, CD/DVD players and 300 thread-count cotton sheets combine to make your overall Signature experience exceptional. The private gated entrance adds an extra level of sophistication and security. Courteous valet staff also await to provide you with free parking and help with your bags. The Signature has its own Front Desk that is separate from the MGM Grand allowing guests to spend more time enjoying Las Vegas and less time waiting in line. The concierge and bell staff will dazzle you with their friendly advice and knowledge of fabulous Las Vegas. You will also be able to enjoy the option of using one of the three pools at The Signature or walking over to the MGM Grand and utilizing their 6 acres of pools, including a lazy river. With all that The Signature has to offer, you will be sure to experience Las Vegas in a way that you have never before!